Growth rate 2-3 feet per year with good maintenance. Soil Wide range from acidic to clay to alkaline, but should not be planted in areas with poor drainage and winter-wet soils. Shape Spreading, umbrella shaped. 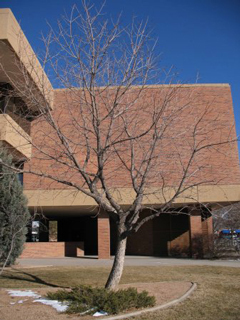 Considered by some to be an ‘ugly ducking’ as young trees can be gawky, unattractive, and misshapen but with maturity they can grow into a magnificent specimen tree. Foliage ‘Lustrous’ dark green in summer and orange to red in fall. The Chinese Pistache has a beautiful fall color, second only to certain maples. 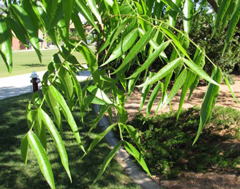 The leaves are alternate, compound, and evenly pinnate in 10-12, 3 inch long leaflets. Flowers and fruit Has male or female trees. 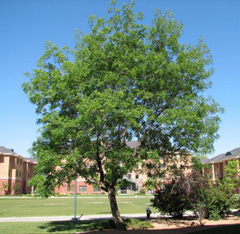 On female trees, green blooms, not showy in April to May. 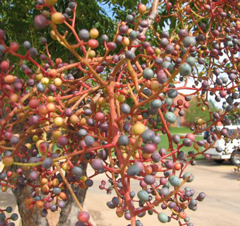 Fruit grows in clusters of pea sized fleshy fruit that are either blue (fertilized) or red (unfertilized). Birds enjoy the fruit, they can be consumed by humans but the seed is considered too small to deal with. 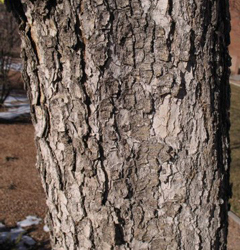 Bark Develops shallow furrows, the ridges becoming scaly, gray to gray-black in color; as the scales flake off they expose a salmon to orange inner bark. Wood Hard, durable and decay resistant. Insects and diseases High genetic resistance to insects and diseases. Best advice Is a tough tree with good fall color and survives urban conditions well. Best in hot, dry areas and can handle receiving only 20 inches of rainfall per year. In some opinions, the male tree has a more handsome form. Some nurseries may carry a male selection called ‘Keith Davey’.